I found out this afternoon that my friend and colleague Gale Stokes died suddenly last Sunday. I first knew him when I was a graduate student in the History Department and he was Rice’s professor of Eastern European history. He seemed harsh to my younger self and I was frankly a bit afraid of him. I marvel at this memory now, because I was so very wrong. Rather than harsh he was simply truthful, a rare and valuable thing that I came to appreciate deeply as time passed. He was a stalwart citizen of the university, serving on innumerable committees and doing stints as department chair and dean. He cared about Rice’s history and was a good friend to the archives, donating his academic and professional papers to the Woodson about a year or so ago. More than that, he was generous with his time and characteristically forthright about how he had seen the university evolve since his arrival in 1968. That IS nice writing, Melissa. I only had him for one CE course, perhaps 15 years ago. RIP, Gayle, we loved knowing you. Dr. Stokes’ daughter and my daughter were classmates in the 1970s and were in a carpool I drove to Pershing Junior High School. As I was making the rounds one morning in a heavy rain in our West University Place neighborhood, at each stop a parent would lean out their front door and yell to me that they knew I was there and their child would be out shortly. I really got wet. When I got to the Stokes’ house, the porch light was turned on and off repeatedly, so I got the message without getting wet. Melissa – what a lovely piece. I wish I had known him, thanks to you. Sorry to hear about Professor Stokes. I took 9 hours of Russian history from him and his instruction was so influential to my current view that I feel he made me into a Condoleeza Rice. Even though he was a veteran of the U.S. Air Force like my father, he was not overly right wing in his orientation nor was he naively sympathetic to the Soviet state like many of those in the academic world. Rather than blame our collision with the Soviets on pure ideology, on the last day of class he attributed a lot of it to the natural confrontations inherent in “big power politics”. In that same class, he logically spoke of the disincentives of collectivism and how that system prevented the Soviets from ever catching up with us. In a graduate course in Russian history, we learned the frustration of trying to install political liberalism in a country which had no such tradition. A valuable lesson in today’s world. The last 5 years (and during the Centenniel) I had the chance to personally thank several of my great Rice professors from the early 1970s for the significant contributions they made to my education and mature world view. I’m sorry that I never had that opportunity to do so with Professor Stokes. But maybe in some sort of metaphysical way this message will get to him. I, too, enjoyed (greatly!) taking Russian history from Dr. Stokes. It was challenging (lots of reading!) and I enjoyed every minute of it. A number of my Rice professors have been role models for me in my career as a faculty member at SUNY Oswego and I credit them greatly for my teaching award. Dr. Stokes was one of those role models. To his family, I am sorry for your loss and I hope the words of his students will be at least a small comfort. Professor Stokes was the best professor/teacher I had at Rice, hands down. His lectures and seminars were always thoughtful, well prepared, and well presented. One lecture that has always stuck with me was his presentation about Basil the Bulgar-slayer, a particularly cruel Byzantine emperor, who after one successful battle captured 15,000 prisoners. He divided them into groups of 100, and blinded 99 out of each group, and blinded one eye of the 100th man so that the last man of each group could lead the others back home to demonstrate the might and power of the great Basil. After the lecture, Professor Stokes was gathering his papers up at the lectern as I walked past, and he seemed visibly shaken. He was shaking his head and said quietly, “I can’t get over such cruelty.” That epitomized his gentle and kind personality. In the summer of 1973, Professor Stokes led a study group to Yugoslavia, and I was fortunate enough to participate in that. Balkan studies were his specialty and it was a great learning experience. I also had the opportunity to see him in another role, that of family man. I was so impressed with his relationship with his son and daughter, which was obviously one of love and mutual respect. 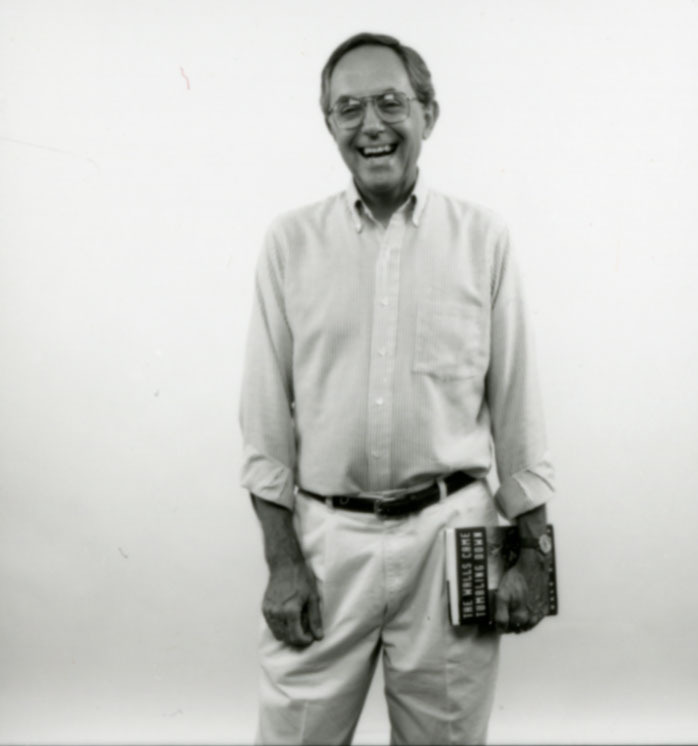 Dr. Stokes had a gentle manner and an understated sense of humor paired with a great laugh! I admired him so much. My heart goes out to his wife Roberta, his daughter Karen, and his son John. Dr Stokes gave me my first bad grade at Rice and told me I was going to have to try harder, especially if I wanted to be a history major. He was absolutely right. He was a huge influence in me becoming a history major and years later, when I became a suspense novelist, he would come to my book signings in Houston. He asked me to speak at the dinner for senior history majors several years ago and I told that story on him, that he’d told me I’d have to work harder to get an A. Everyone laughed because they knew it was true about him–he was blunt, but in a good way. He was a wonderful teacher and professor, and my thoughts and condolences are with his family and the entire Rice community. He was a tough grader. I recall a paper that I did in the Balkan History seminar on Tito that he felt I could have done better on given my level of scholarship. He always pushed me to do better and, knowing that my father was a historian and history professor, he felt like I should be achieving a higher potential. I concur Jeff with your assessments of Dr. Stokes. On one of my final exams in an upper level Russian history course, he wrote “This is one of the few essays that I can say I learned something from!” Coming from Professor Stokes, that was the highest compliment I ever received in my academic career. I took that class in 1983. It was what inspired me to specialize in Russian history within my history major. Thank you everyone for these kind words about my father. Your words of respect and friendship are a testament to my father, and are greatly appreciated by my family. He was a wonderful father and I loved him deeply. Thank you again. Karen, he spoke of you very often. He was so proud of your work and made sure that we had the video of the dance at the dedication of the Humanities Building in the archives. I’m so sorry for your loss. I’ll miss him very much. Gale Stokes was one of my favorite professors. My wife (Elaine Kolodzie, 1972) and I took a course on Russian History taught by him in the early 1970s. I remember Dr. Stokes as an entertaining lecturer who was very approachable. Once I spoke to him after a class about Sergei Eisenstein’s classic Russian film “Ivan The Terrible.” Dr. Stokes was happy to discuss the film and its historic context as well as imitate the eye-rolling style of the actors. Our favorite memory though is one of Dr. Stoke’s stories about his travels in Russia. He said the Russians had trouble with his simple, two syllable name. They preferred to pronounce it with four syllables. To us he will always be Gha Ley Sto Kes, a good man and a great teacher. May he rest in peace. That made me laugh. When we went to Yugoslavia, the people there also called him Gah-leh Sto-kes! I had the great good luck to take an Eastern European politics class with Dr Stokes in 1990/91, when The Wall came down and not long before Yugoslavia went kablooey. Fascinating stuff and yes, I also found him intimidating! But he was a great advisor and I still remember a lot from his courses. RIP and condolences to his family. I left Rice several years ago and have relocated to Vienna, Austria. When the sad news of Gale Stokes’ death reached me, I immediately thought of the huge loss to his family–and so I want to express my profound condolences to Roberta, Karen, and John. Rice lost a truly impressive faculty member whose many contributions (in scholarship, administration, and teaching) are now part of the institution’s rich history and its legacy. Two memorable moments for me: Gale’s visible pride during the splendid opening of the Humanities building. Gale’s blunt comparison of the Serbs’ persecution of the Bosnians with certain academic departments at Rice intent on wiping out another unit. Beyond his academic work, Gale loved ethic culture and dancing. He and his family danced with the Houston International Folk Dancers. We could draw on his linguistic knowledge and knowledge of the cultures from time to time. His and his wife Roberta’s love of dancing was cummunicated to his daughter Karen who has a respected career in dance. In this age where many people express vile comments about different cultures Gale never uttered any derogatory words. He was realistic about the hateful politics in the world but he had deep respect for all peoples and cultures. He said he wouldn’t dance in our occasional exhibitions because he didn’t want to be seen as being partisan toward one ethnic group. He was the first person I contacted about dancing when I came to Houston almost 40 years ago. His comments and reading recommendations about the Eastern Europe cultures were appreciated. He was a good dancer, and a true friend. He is missed by all of his dance family. John – thank you for this message. Dad loved his folk dance family. Having become acquainted with and impressed by Professor Gale Stokes during AAASS (American Association for the Advancement of Slavic Studies) conferences in the late 1970s, I invited him to serve as my co-leader and our Yugoslav specialist on a tour I’d organized for the special 1984 Oberammergau Passion Play: Our group would start in Dubrovnik, work our way up into Austria, and finally finish in Bavaria. Gale and Roberta were SUPERB traveling companions, and yes, we did some folk dancing (In the Austrian village of St. Gilgen)! I find the world a sadder place now that I’ve learned of Gale Stokes’ death. I met Gale Stokes in former Yugoslavia about 60 years ago. He was very gender, curious and educated man.- We became friends and had a correspondence since then. Later I met him several times, when he visited Yugoslavia and then Slovenia. I am much sorry for him. Such professors are rare. I wanted to express my sympathies as well. I had taken Professor Stokes’ course on Yugoslavia history in 1979, as well as an independent study on Stalinism. I currently live and work in the former Yugoslavia and owe my love — and hopefully deeper understanding — to Dr. Stokes. Thank you Will – nice to see that individuals still posting remembrances. My world has been made smaller by his departure. I did not know Dr. Stokes well at all. In fact, I was a high school student doing an independent study project on Bulgarian history and my school administrator pushed me to contact him and ask him to be my mentor. I did not think that such an important scholar would take on a high school student, but to my great surprise, he agreed and gave me an hour of his time during some of his free afternoons. He did come off as harsh, but it was only truthful and helped me prepare for the rigors of college. He actually contacted me later on, months after I completed the project, and told me that there was a Bulgarian cultural festival being held in Houston. I was very flattered that he remembered me and I am very sad to hear that he passed. Thank you for remembering my father. Not a day goes by that I don’t miss him.